7:00 Introduction, local and international news, and weather. 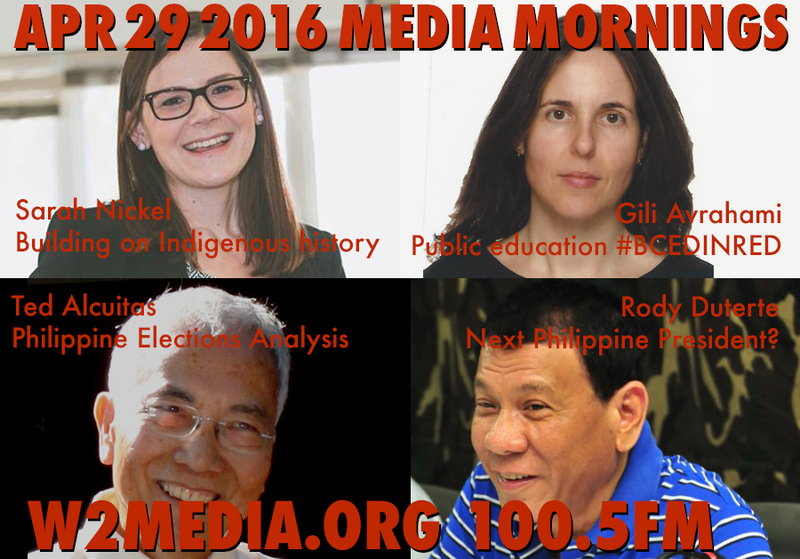 7:15 Ted Alcuitas, Editor, Philippine Canadian News, on the current Philippine election campaign, prospects for a progressive President, and the death of a Canadian hostage by Abu Sayyaf. 7:30 Sarah Nickel on how #OccupyINAC has drawn on long established political strategies, and links between 2016 and how Indigenous peoples have occupied Indian Affairs offices before, including way back in 1975. Sarah is an assistant professor of Indigenous Studies at the University of Saskatchewan. 7:42 PREVIEW: May Day March VDLC and BC Fed. Sunday 1:30 leaves Clark Park on Commercial Drive @ 14th and down to 2pm Grandview Park rally.